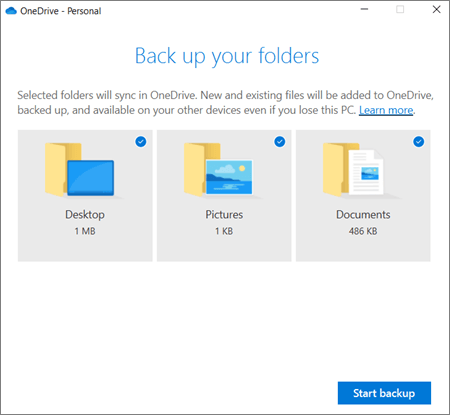 You can use folder protection to back up your important folders on your PC (your Desktop, Documents, and Pictures folders) with OneDrive, so they're protected and available on other devices. 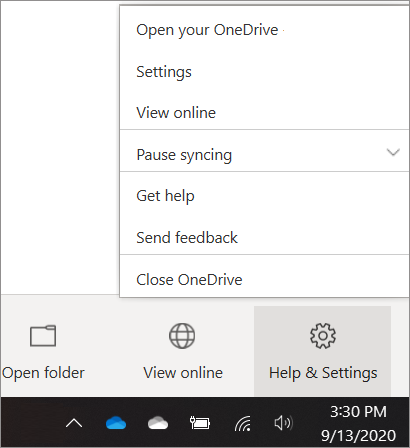 If you haven't already set up OneDrive on your computer, see sync files with the OneDrive sync client in Windows. There's no extra cost to use folder protection (up to 5 GB of files without a subscription). See OneDrive Plans. Note: If you're surprised that your files are saving to OneDrive, see Files save to OneDrive by default in Windows 10. If you're prompted to protect your important folders (Desktop, Documents, and Pictures), click the prompt to start the folder protection wizard. If you didn't see the prompt or you already closed the wizard, select the white or blue cloud icon in the Windows notification area, and then select More > Settings > Backup > Manage backup. In the Set up protection of important folders dialog box, make sure the folders that you want to protect are selected. You can close the dialog box while your files sync to OneDrive. Or, to watch your files sync, select View upload progress. If you already closed the dialog box, select the white or blue cloud in the notification area to open the OneDrive activity center. When the files finish syncing to OneDrive, they're protected and you can access them from anywhere in Documents, Desktop, or Pictures. When you protect your Desktop folder, the items on your desktop roam with you to your other PC desktops where you're running OneDrive. You can protect up to 5 GB of files in OneDrive for free, or up to 1 TB with an Office 365 subscription. If want to stop protecting or start protecting an important folder in OneDrive, you can update your folders in OneDrive Settings. Important: When you stop protecting a folder, the files that were already protected by OneDrive stay in OneDrive. If you no longer want those files in OneDrive, you'll need to move them to a local folder on your PC yourself. Any new files you add to that folder on your PC won't be protected by OneDrive. In Settings, select Backup > Manage backup. 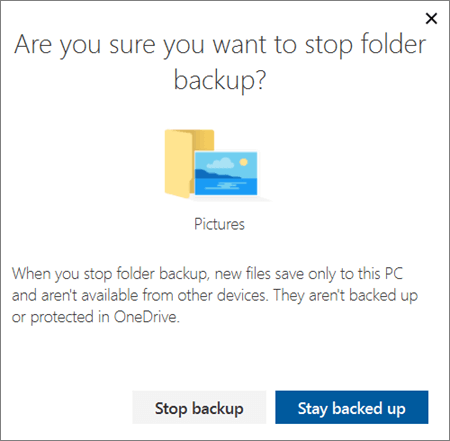 To stop protecting a folder, select Stop protecting and then confirm that you want to stop protection in the Are you sure you want to stop folder backup dialog box by clicking Stop backup. To start protecting a folder, select any folder that doesn't say Files protected, and then select Start protection. The following file types can't be protected: Outlook database files (.pst) and OneNote files that aren't already stored in OneDrive (.one, .onepkg, .onetoc, .onetoc2). To continue protecting the folder, move your OneNote notebooks to OneDrive or remove these items from the folder you want to protect, and then try again. Folder protection is unavailable: A common reason for this error is that important folders on PCs that are connected to a domain can't be protected in a personal OneDrive account (when you're signed in with a Microsoft account). Please contact your IT administrator about data protection solutions. You shouldn’t have this issue with a work or school account. To resolve this, shorten the name of your file or the name of subfolders in OneDrive, or select a sub-folder that's closer to the top-level folder. File exceeds the maximum file size: OneDrive can't sync files over 15GB if you're signed in to a Microsoft account, or over 15GB if you're signed in to a work or school account. Remove these files from the folder you want to protect and then try again. The file name isn't allowed in OneDrive: File names can't start with a space or include any of these characters: \ : / * ? < > " |. Please move or rename the file to continue. The folder isn't selected for syncing: The folder with the error is not syncing to your PC. To resolve this error, open OneDrive Settings (right-click the white or blue cloud icon in your notification area, and click Settings), click Choose Folders, and then make sure the folder you want to protect is selected. If Pictures is showing this error, make sure that Pictures, Screenshots, and Camera Roll are all selected (or don't exist). It's also possible that the OneDrive folder has a different name from the Windows important folder. The folder is on a different volume than OneDrive: OneDrive is set up to sync on a different volume than the folder selected for protection. A couple of common ways this can happen are 1) if you set up your PC such that OneDrive is on the D: drive, but the Documents folder is on the C: drive, or 2) if you have your folders pointed to a network share (this would most likely happen at school or work). To resolve this issue, set up OneDrive on the same volume as the folder you're trying to protect. In OneDrive settings, click Unlink this PC. After unlinking, sign in again and choose the root folder location to be on the same volume as the folder you want to sync. You can also manually move the folder you want to sync to the same volume as OneDrive by right-clicking the folder, selecting the location tab, and choosing a location that's on the same volume as OneDrive. Important folders aren't in the default locations: The folder with the error contains another important folder and can't be protected until the contained folder is moved. Important folders that may be contained within the folder include: Documents, Desktop, Pictures, Screenshots, Camera Roll, or the OneDrive folder. An unknown error occurred, with error code 0x80070005: If you receive error code 0x80070005, the "Prohibit User from manually redirecting Profile Folders" group policy is enabled. You may find that the files from the folders you selected were moved to identically named folders in your OneDrive folder, and the original locations are empty. Move the folder contents back to the original locations and ask your administrator whether the policy can be changed. Folder contains a reparse point (junction point or symlink): The folder you want to protect contains a special file type that links parts of the file system together. These items can't be protected. To protect the folder, remove the file causing the issue. Caution: Some applications may depend on these links to function properly. Remove only the links that you know are safe to modify. If Microsoft Outlook or OneDrive is misbehaving and your PST file is in OneDrive, you might want to try removing the Outlook .pst data file from OneDrive.